April 16, 2013 -- Tendance Coatesy , posted at Links International journal of Socialist Renewal with Andrew Coates' permission -- Perry Anderson was writing about incomes policies. Attempts to impose, or reach by union consent, agreements about pay levels would be made by successive governments, Conservative Party or Labour Party, right until Margaret Thatcher’s victory in 1979. That is, pay disputes became political because the cabinet and the state were involved. These, as is well-known, featured prominently during the decade. The unions’ efforts to defend and increase their members' salaries, from the late sixties "wage drift" to the need to adjust to inflation, led to countless disputes. Some on the left thought that the resulting “profit squeeze” of the period was a sign of growing working-class strength. Others held them responsible for the country’s (relative) decline. There is a library of literature on this subject. But Anderson could equally have referred to the way in which the authority of British capitalism was challenged from the inside. That is through demands and efforts to make real workers’ power within companies. This movement had an influential and coherent voice. The Institute for Workers’ Control was formed in 1968, with the support of Hugh Scanlon of the Engineering union (AEU) and Jack Jones of the Transport and General Workers’ Union (T&G). It was influential (though never dominant) within the Labour Party and the wider left. The Institute’s conferences debated a broad range of proposals to introduce industrial democracy. Above all, management’s right to manage was disputed. In the wake of Thatcher’s death her supporters have shouted loudly about the role of the trade unions in the 1970s. They state that organised labour had undue influence over the Harold Wilson and James Callaghan Labour cabinets (1974-1979), that they pressured them to shore up unprofitable industries, that they stifled enterprise. It was common to talk about “corporatism”, the way in which efforts were made to draw unions, employers and the state together formally through bodies such as the National Enterprise Board (NEB). The media has given ample publicity to those who claim that Thatcher freed them from union-backed state regulation. That an open market enabled them to succeed. That they took responsibility for their own fate and succeeded. Everybody should be like me – look at my wad! – is the boast. Perhaps instead of pointing to the delusions of those who think so highly of their own talents, or to the victims of the same market process, we should consider the forward-looking ideas of the 1970s left. Indeed, with its grassroots democratic hopes, it might be better to look at this not so distant past, before going further back to the 1945 Labour government. The Institute for Workers’ Control was not a defensive but an offensive movement. It asked the simple question: if democracy is such a good thing for politics, why is it not the rule at work? If individual responsibility is to be forced down people’s throats (as is now happening again under "welfare reform"), what is wrong with people taking responsibility for the companies that employ them? Karl Marx described the way in which in the market we are "free", the “very Eden of the innate rights of man”? But at the same time, within production, factory, office or shop, there is a sign “No admittance except on business” (page 280. Capital Vol. 1, Penguin edition). In this respect have we not gone beyond the 19th century? 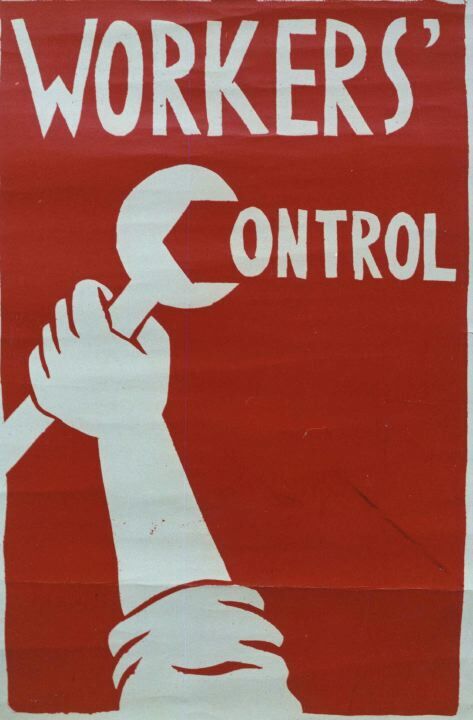 Workers’ Control: Another World is Possible by Ken Coates (2003) offers valuable material from the Institute for Workers’ Control (which dissolved in the 1980s). Ken Coates' article, "Democracy and Workers’ Control" (published in Towards Socialism, eds Perry Anderson, Robin Blackburn, 1965) describes the “antithetical natures of private property and democracy”. He criticised "paternalistic Fabianism”, that is the nationalised industries run by civil servants. Coates talked of “humanising labour” through democratically run enterprises, of “self-management” within a wider system of democratic planning. With an eye to the influence of bottom-up power through shop stewards, he outlines problems reconciling unions, producers, consumers and the general interest. These difficulties were themselves debated during the 1920s, between the Fabians and the forerunners of workers’ control, such as G.D.H. Cole. But Coates’ piece remains fundamentally optimistic about the future. In 1971 there was the famous Upper Clyde Shipbuilders (UCS) "work in". For a while the industry was sustained with state support. Shipyards were nationalised when Harold Wilson came to power in 1974. Throughout the 1970s there were other occupations. Coates states that between July and March 1974 there were 102 occupations, largely in defence of employment. In 1974 Tony Benn became secretary of state of industry. The Norton Villiers Triumph factory at Meriden received assistance, as did others. Workers’ cooperatives were set up at Meridan and the Scottish Daily News. The reformed Kirkby Manufacturing and Engineering Company received aid directly from the state. All these efforts were criticised on the extra-parliamentary left. Arthur Scargill advocated "collective bargaining" rather than control as the pivotal means for unions to exercise democratic power. Coates nevertheless defended not only plans for workers’ control in general but the co-ops in particular. For him they were something that could help political pluralism in a socialist society. Coates observed that, “unless autonomous groups are able to defend their interests against the wider collective if necessary, the democratic process becomes a purely ideal one, with no material foundation”. Any hopes by the Institute of Workers’ Control that the Labour government would introduce other, more general, measures favourable to self-management were dashed with the Bullock Report (1976). This Inquiry into industrial democracy recommend creating company boards composed of equal numbers of worker-directors and shareholder representatives mediated by a third group of “mutually agreeable technical appointments”. It remained a dead letter. Coates did however note that without a “wholesale breakthrough in the struggle for democracy” these experiments would remain isolated, ruled by normal market forces. It is, in retrospect, easy to say that promoting a restructured company in a market that has already squeezed them out was not a way to pick "winners". The same would hold for legislation, even as weak as Bullock’s propositions. There were no widespread factory occupations, demonstrations or public agitation for industrial democracy. The movement for workers’ control caused great offence. It dared to say that there was no divine right to own and to manage, to hold onto companies and to order people about. Resistance was strong, not least from the Conservative Party and large parts of the media which were beside themselves with hatred and venom against "Bennery". The prospect of a socialist left winning power, of genuine trade union power, was met by hysterical attacks on "militants". Individuals were singled out and stalked by the press. This laid the template for later attacks on "loony left" municipal councils during he 1980s. These attacks provided a useful pretext for the government to ignore any left-wing and radical trade union ideas, even if they were reflected in the Labour Party’s Manifesto. The Lucas Aerospace workers, who proposed to convert their company to “socially useful production”, received “passive resistance” from the Wilson government after 1975. The National Enterprise Board, which attempted to introduce planning agreements across the whole of industry, became a straight-forward prop for companies requiring aid, rather than a source of innovation, let alone workers’ control. Workers in the newly nationalised shipyards and in the two co-operatives met a similar fate to workers in the NEB controlled companies: no control over the major decisions concerning their future, such control being blocked by the civil service, the government and/or the pressures of collapsing markets; no consideration of the social costs of job loss, other than in terms of financial compensation; and no questioning of the purpose of the product or to whom it is sold (a point raised very strongly by workers in Rolls-Royce, until recently an NEB controlled company. The Alternative Economic Strategy (AES) emerged as the left’s energies were concentrated on recovering the Labour Party from the Wilson and Callaghan leaderships. This is not the place for a full discussion of the AES. But it is important to note that it focused on making the “planning agreements” real (compulsory if need be). Workers’ democracy (expanded over the years into the ‘community’) formed part of the strategy. In 1979 there was an “explosive rebellion of low-paid workers”. “Strong inflationary pressures, combined with a rigorous freeze on all but minimum wage settlements, were reducing the standards of the poorest workers. Labour votes were thus being lost, first among the most, and them among the least skilled parts of the working population the best and worst paid employees.” Thatcher won the general election. Workers’ Control describes the smaller-scale local government support for self-management and cooperative enterprises in the early 1980s. But these too went under in the “blizzard” that followed. By the mid-1990s the Labour Party had dropped Clause Four [the socialist objective], which for Ken Coates and many other socialists, was, among other things, a recognition of the importance of industrial democracy. During the 1980s much of the British left lost interest in workers’ control. It preferred self-organisation in “civil society”. The AES, like its 1970s French counterpart, promoted by the Parti Socialiste current, CERES, relied on a combination of the state and grassroots activity. In France autogestion (self-management) could be interpreted in two different ways. Either as, for CERES of that time, a form of industrial democracy, helped by nationalisation or a collection of pluralist social initiatives outside the public administration, helped by regulation.In elaborating the latter Michel Rocard declared that the state had no role as a “producer”. (Les socialistes français et le Pouvoir, Alain Bergounioux, Gérard Grunberg, 2005). One could say that he cast doubt on any form of nationalisation or social ownership. In 1981 the Socialist Party’s Projet Socialiste had contained the CERES ideas. The victorious left government introduced legislation giving workers increased rights in companies (Lois Auroux). But even during the period of alliance (1981-1984) with the Parti Communiste Français (Union de la Gauche) these were little more than a weaker version of Bullock. By the end of Mitterrand’s presidency the tide had shifted in favour of Rocard’s ideas. He himself became prime minister in May 1988 (until May 1991) to run up against the strong opposition of public employees, and his own party. This resistance, nevertheless, did not stem the tide. The Socialist Party has yet to return to a program for greater social ownership under workers’ self-management. As the 1980s wore on it would become apparent that the Labour Party, in very different conditions, was drifting nevertheless in a similar doctrinal direction to Rocard. The way was prepared for the "Third Way". The only remnant of the movement for workers’ control in the official Labour Party was a vague commitment to "social partnership' – a dose of employee participation. Today the Conservatives and Liberal Democrats intend to strip even the directly public funded sphere of democratic control. State functions are being hived off to private companies, only tenuously accountable to democratic control. In the expanded private sector fear and management control go together. It is true that a major fight, over plans to punish the poor and put them under the responsibility of private companies and the (remaining) state, has changed the focus of the left. But we need something positive to aspire to, to combat the hatred and despair the Liberal-Conservative coalition government promotes. Perhaps the time has come to develop a new program of workers’ control, to challenge the idea that democracy ends the moment you enter the workplace. Not perhaps… the time has come!